For the year that I lived on West 81st Street, I frequented Land Thai Kitchen all the time. Not only is their food fabulous, but their take-out is fast. It quickly became a favorite of mine! When I got off work, I’d phone in my order, and by the time I’d walked to Land just ten minutes away, my order was ready. Land serves great food, the staff is friendly, and the ambiance is fun. It is definitely a “do not miss” when you come to the UWS, (that’s Upper West Side for those of you non-locals). One of my favorites. 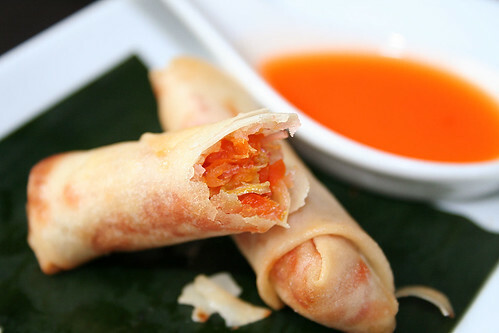 The Root Vegetable Spring Roll, parsnip, carrot, beet, lotus root, and glass noodle served with a plum sauce. I’m a lover of spring rolls and am always on the look-out for the best. These definitely qualify as one of the best. Crispy and sweet, I get them each time I come. Another of my favorites? 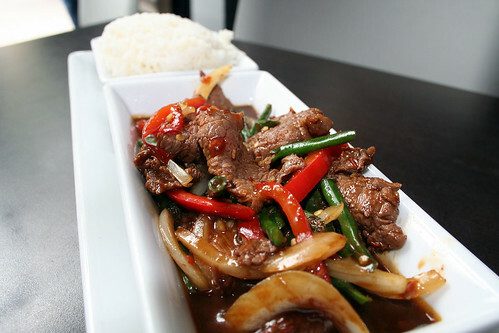 Why the Wok Basil with Beef, long bean, red pepper, chili-garlic puree and Thai basil sauce. I order it mild and it still clears my sinuses and burns mouth. For those of you fire lovers out there, this one’s for you. Tender beef, flavorful sauces, fragrant rice. Mmmmm. They serve a Lunch Prix Fixe each day between 12:00 and 3:30. I usually get take-out at dinner, but in honor of taking these photos, I went for lunch (the smaller portions are shown here). Land is typical of most NYC restaurants, long and skinny the tables sit close together to maximize seating in the small space. The high ceilings make it feel open and spacious, and the modern clean lines and dark woods combine to create an elegant Asian feel. In the evenings and during lunch, Land is always packed. (Have I mentioned take-out?) They don’t take reservations so plan to arrive early or wait for a few minutes to get in. Either way, it’s worth the wait. Of course if you live nearby, this yummy food is only a phone call away. Besides, the NY Times like them too.